Today is our 25th wedding anniversary. I'm pretty sure you're supposed to get a trip to Italy on your 25th but we're buying a house instead. That's okay too. 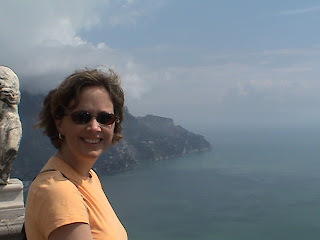 I did get a fabulous trip for my 20th wedding anniversary which in my mind makes today the perfect day to write another post about 'my happy place'... Italy. 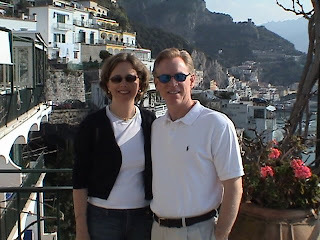 We celebrated our 20th anniversary in the little town of Amalfi on the coast of Italy. Technically we spent our 20th wedding anniversary at daughter2's 8th grade graduation ceremony in England which was nice and all but...we took our anniversary trip the following March and although it was late we considered it a celebration of our 20th and truly, anytime is a good time to see Italy. 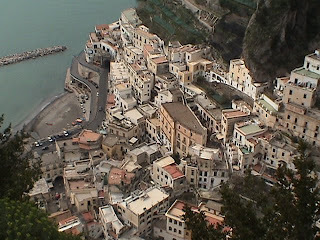 To visit the Amalfi Coast we flew into Naples and hired a driver to take us to our hotel about an hour up the coast. You could rent a car but it's not a place we wanted to be driving ourselves so we hired a driver for our stay. His name was Marco and he acted a bit like tour guide too which was really helpful. 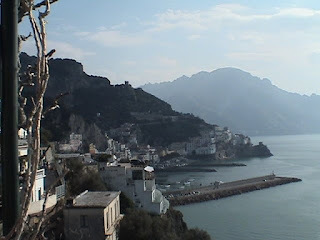 And here's a tip...take your Dramamine...the road from Naples up the coast winds around and around and around and around and around with magnificent views of lemon groves and the bright blue sea and your car hugs the side of the mountain (hopefully!) as you go up and up and down and down and around and around. 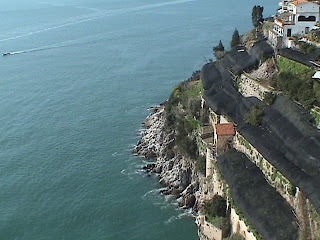 We stayed in one of my favorite hotels, The Santa Caterina, which is perched into the cliffside of Amalfi with a restaurant that juts out over the crystal clear blue sea. So beautiful. The lounge area was decorated all in white and was so restful. Every evening my husband and I sat there with a glass of wine and a bowl of the best olives I've ever eaten in my life. The first night they brought a bowl of these olives to us I wondered if they had something artificial added to them since they are very very bright green. But it's just the way they grow and they are not packed into any oil, just seawater. Honestly I could eat my weight in olives in Amalfi. We spent the days wandering around the little villages along the coast...The village of Ravello was probably our favorite. And it's not just because I loaded up on Italian pottery there. I mean I may have bought some pottery but that's not the only reason why it was our favorite. It is just so picturesque. Exactly as you'd imagine an Italian village should be. We strolled around the grounds of two lovely villas there, the 12th century Villa Rufolo and the 11th century Villa Cimbrone, both with amazing gardens. Villa Cimbrone has one of the best panoramic views on the coast. You have to stand on a patio that literally hangs out over the sea but the view is absolutely worth it. To get to the villa you walk up a very narrow alley and while we were there they were constructing a patio up top. The sand came up two buckets at a time on the back of a donkey. I'm pretty sure the patio isn't completed today, 5 years later. But that's okay. It's Italy and they take time to smell the roses there. 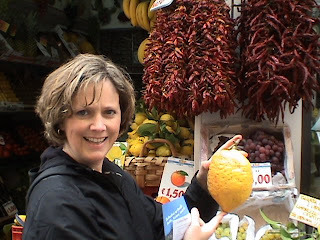 Or maybe I should say the lemons because the Amalfi coast is covered in lemon trees. Some were still covered with a black wrap that is used to protect them from the winter weather. They grow up the side of the steep hills and they don't look like any lemons I've ever seen. On a visit to the market in town I pointed to a lemon and asked the shopkeeper what the fruit was thinking it was some kind of combination of a lemon and something else. But, no, this is just how the lemons grow here. Our driver, Marco, brought me one from his father's garden one day (because like I said its Italy and the Italians love their visitors and they love their countryside and they want you to love it too...and I do) and anyway he told me I could eat the whole thing. A lemon liqueur known as Limoncello is made in this part of Italy and its served in frozen glasses and is yummy. There is a very pretty little 11th century 'duomo' (church) in Amalfi, The Church of St. Andrew, and it contains the remains of the disciple Andrew. We visited the church one day and then spent time sipping Espressos at a cafe in the square. Fantastico! On our last day here we visited Pompeii. The size of it is absolutely staggering. I don't know what I was expecting but you could walk thru mile upon mile of ruins. Mt. Vesuvius sits back in the distance and there were excursions up there but we didn't do that on this trip. I could go on and on about Italy but since it's our anniversary I probably should at least mention my husband. He'll understand because he loves Italy as much as I do and we both look back at our trip to Amalfi as one of our favorites. And... I'd love to post a picture from my wedding day but my wedding album is currently traveling across the sea and most other photos from the day are in my storage container which is being delivered tomorrow. My husband has a special birthday coming up this year so I plan to write more about him then but for now, if I were to tell you what I love most about him it would be this... he loves life, he isn't afraid to try new things, he never met a stranger, and he can make me laugh. He has worked hard all of our married life and is a wonderful provider. He is also a terrific father who adores his sweet daughters. I love this boy. 25 years ago I could not have forseen where life would take us and I don't think either of us could have imagined the adventure it has been. Tonite we're having dinner at a little Italian restaurant nearby. The owner is from Naples. It's the next best thing to being there. What a great travel article! And Charlie and I LOVE the idea of going to Italy. Thanks again for sharing another story of your travels. And Happy Anniversary!!!!! Isn't Italy the most incredible place? I went there when I was in Europe and it was a favorite of mine, as well. 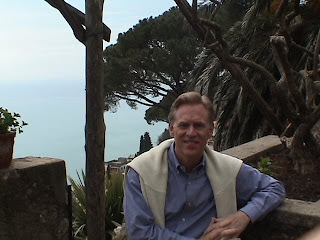 I did not go to Amalfi, but we did go to Rome, Florence and Pompeii. I hope to return some day. HAPPY ANNIVERSARY!!! Love & blessings from NC! Love this post! 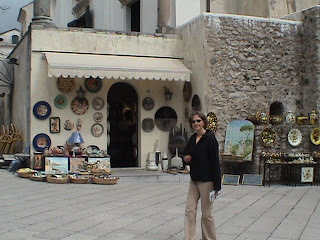 Your Italy pics and comments reminded me of our trip in 2002--I think I bought pottery at the same shop in Ravello! 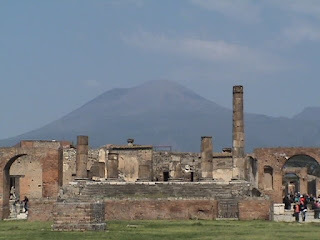 And Pompeii is a wonder of wonders that I'll never forget. The best part of your anniversary post, aside from reminiscing with you about the Amalfi coast, was your testament to your marriage. CONGRATULATIONS ON 25! I loved reading all about Italy. Great reading...I am telling you, you have a REAL talent as a writer.